With two bank holidays breaking up this long month the Lake District is abuzz. There are plenty of interesting activities in the Lake District this May. You can experience delicious dining, fantastic festivals, superb shows and verdant countryside. Come and have a look at some more unusual things to in the Lake District this May. If bank holiday festivals and events are not your thing and you’d like to escape the crowds, then this one is for you. The emblem of love and success, Emerald is the birthstone of May. For those who don’t know about it, ‘Emerald Lake’ at Hodge Close Quarry, Langdale, is one of the Lake District’s secret gems. 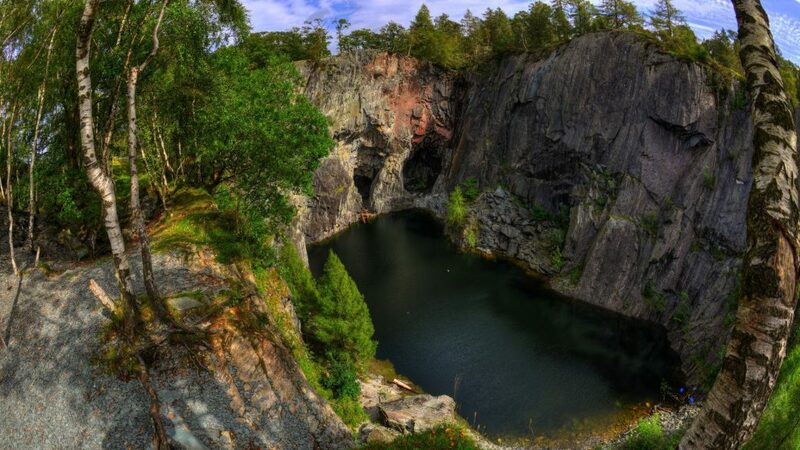 Known locally as ‘Emerald Lake’, because of it’s deep, elegant colouring, this slate quarry is best viewed from above. Look down on Hodge Close, one of several open mines in the Tilberthwaite Valley. Here the reflections of the sheer cliff-sides in the emerald green water is mesmerising. As is the scale as you look 150 feet down into the paradise-like pool. Don’t be fooled, as there’s another 150 feet below the water, where you may see divers exploring. This is not an enclosed mine and the sheer face is popular with abseilers. But caution is needed so please be very, very careful especially if you have children and pets with you. This 3 miles Hodge Close walk also takes in Cathedral Quarry, which is also worth a look. There are 18 islands on Lake Windermere. ‘Lilies of the Valley East and West’ are two of them, so named after the flowers which once grew on these islands. Lily of the Valley is the birth flower of May. And whilst the beautiful fauna is no longer found on Windermere’s islands, they are a floating paradise of wildlife that you simply must explore. Pack a picnic hamper, warm clothes for being on the lake, and with no experience necessary you can hire a motorboat from Bowness Marina to cruise around the central islands. Plus pooch can join you! 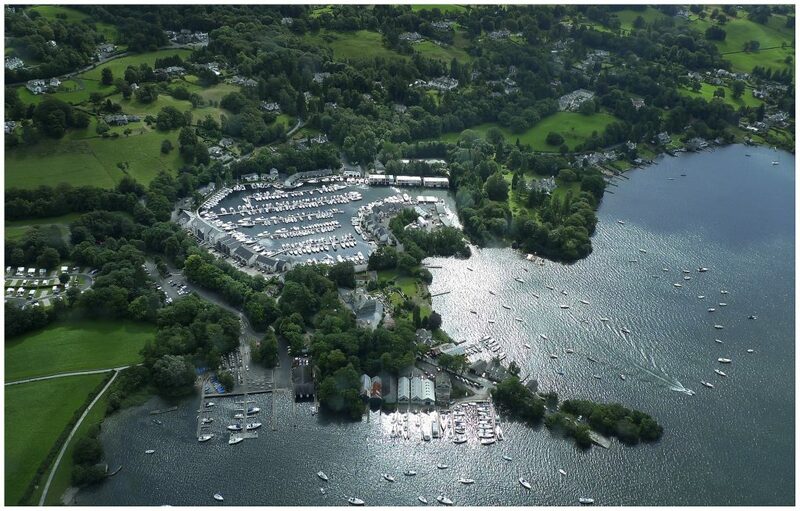 On the weekend of the 12th – 14th May 2017 head to Windermere Boat Show. Not only will there be a display of impressive new boats but you can enjoy free 90 minute scenic kayak tours of Windermere’s stunning scenery. Or chance yourself at SUP (Stand Up Paddleboarding). On 9 May 1951 the Lake District was designated a National Park. The Cross Bay walk at Morecambe Bay is a great way to see a side to the Lake District that many miss. From May, the dangerous tides of Morecambe Bay allow walkers to make the famous and exciting 8 mile cross over the sands between Arnside and Kents Bank. There are several guided walks, which we recommend you joining, as the sand and tides are unpredictable. You will be escorted across the 8 mile walk by Cedric Robinson MBE. He is the 25th royal appointed guide. It is a relaxing as well as exciting experience where you can experience up close some of what makes the Lake District National park, which includes 26 miles of shoreline, so unique. Remember, don’t just turn up, join an organised walk via a charity, such as Cumbria Wildlife Trust. Muncaster Castle is the place to go to experience traditional Lake District festivities. The haunted historic castle hosts the ‘Cumberland Sausage, Food & Drink Festival’ over the early May bank holiday, 1st May. Whilst a carnival atmosphere hits the castle grounds, with Muncaster Festival running over the Spring bank holiday weekend, from the 28th – 30th May. Whilst Mucaster Castle’s haunted history may be a bit scary, this is an excellent place to visit with children in tow. If the Enchanted Trail, with stepping stones, fairy doors and wooden dens to explore, as well as the Adventure Playground outside isn’t enough, the indoor MeadowVole Maze is good fun for little visitors. You must also make a visit to Muncaster bluebell woods (May is the perfect time of year). The woodland floor is awash with the striking blue and the air filled with the heady scent of the English bluebells. You can distinguish them by their ‘nodding’ heads rather than the upright stems of their Spanish counterparts. “Here we go gathering nuts in May,” really meaning “knots”, meaning bunches of flowers. Indeed May, the month of fertility, is the best time of year to see an abundance of interesting flora and fauna that is unique to the Lake District. Nesting season is well underway and the unspoilt and outstanding natural beauty of Bassenthwaite is a must this time of year. Especially as KL, the majestic ringed Osprey has returned to the Lake District Osprey Project nesting site, after spending the winter in Africa. KL and the unringed partner she brought back are the first Osprey’s to breed in the Lake District for 150 years. And so it is worth heading to the free viewing points at Dodd Wood to spend some time with them and their soon-to-be chicks. Whilst in the area, head to Whinlatter Forest, the UK’s only true mountain forest for excellent walking and mountain biking trails. Plus an enormous WildPlay adventure park! This May you can catch some imaginative species of creatures on the amazing, new digital “Gruffalo Spotters Trail”. Follow clues and footprint marker posts, where, via the specially designed The Gruffalo Spotter app Mouse, Fox, Owl, Snake and the Gruffalo appear before your eyes! In the central lakes, May marks the beginning of Garden Tours at Hill Top, former home of children’s author Beatrix Potter. Meeting strictly “at the veg plot” the 21st Century Mr McGregor, Pete, gives an insightful guided tour around Beatrix Potter’s farm garden. Sniff out the distinctive garlic aroma of Wild Garlic. Look for lush, pointy green leaves and pretty clusters of white flowers, as you ramble along woodland paths in particular. Throw the leaves into a Spring salad and pop a jar of the flowers on your Lake District Holiday Cottage table and feel suitably countrified! ← The Glastonbury of Racing!